A range of packaged plant milks from a Western grocery store. A milk substitute (or, more precisely, an analogue of mammalian milk) (also called milk alternative or milk analogue) can refer to a liquid considered (particularly in the USA and other western countries) as a replacement for the milk from a mammal (mainly cows and humans). Mammalian milk analogues are white or whitish liquids that resemble either dairy or human breast milk. Milk substitutes for non-infant consumption take two very different forms: plant milks, which are liquids made from plants and may be home-made or commercially produced, and coffee creamers, synthetic products invented in the USA in the 1900s and created specifically to replace dairy milk in coffee. Non-dairy milks are less likely to be regarded as substitutes for dairy milk in non-western countries where dairy production has been less predominant and where there are much higher incidences of lactose intolerance. Around the world, plant milks have been consumed traditionally for hundreds, if not thousands, of years. Due to their composition, alternatives to dairy milk may have a longer shelf life and may be able to withstand higher temperatures than dairy milk without spoiling. [full citation needed][verification needed] Some milk substitutes are marketed as being healthier than cow's milk due to being lower in saturated fat and (if entirely free of animal products) cholesterol-free. When milk analogues are lacking in vitamins or dietary minerals present in dairy milk (such as vitamin B12 or calcium), they may be fortified. Humans may consume dairy milk for a variety of reasons, including tradition, availability and nutritional value (especially minerals like calcium, vitamins such as B12, and protein). Dairy milk substitutes may be expected to meet such standards, though there are no legal requirements for them to do so.[where?] This may result in additives being put into milk substitutes to compensate for the absence of certain vitamins, minerals and/or proteins. [full citation needed] Infant formula, whether based on cow's milk, soy or rice, is usually fortified with iron and other dietary nutrients. Coconut milk is made by mixing water with the freshly grated white inside pulp of a ripe coconut. Though considered by some in the west as a substitute for dairy milk, coconut milk has been used as a traditional ingredient in Southeast Asian, South Asian, Caribbean, and northern South American cuisines for centuries, if not millenia. It is also a source of calcium and vitamins C, E, B1, B3, B5 and B6. Coconut milk is usually very high in fat and calories, but low in protein, which makes it a good substitute for cream, as it can be whipped up in a similar fashion to decorate baked goods or desserts. 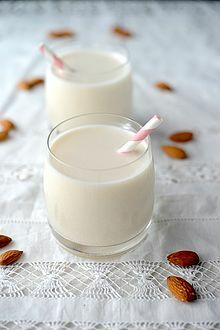 Almond milk is produced from almonds by grinding almonds with water, then straining the pulp from the liquid. This procedure can be done at home. Almond milk is low in saturated fat and calories. 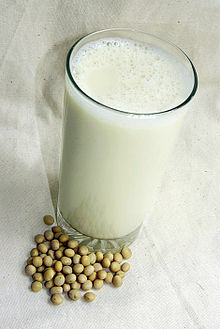 Soy milk is made from soybeans and contains about the same amount of protein as dairy milk. When enriched by the manufacturer, it may be a source of calcium and vitamin D and some B vitamins such as B12; however, this is not in all brands of soy milk. According to one study, soy protein may be a substitution for animal protein to prevent and control Chronic kidney disease. Rice milk is mostly used for baking because of its sweet taste, but in case of a nut or soy allergy a grain milk processed from rice may be preferable. When fortified, this milk can be a source of calcium, vitamin B12, and vitamin D2. Hemp milk is made by grinding hemp seeds with water, which are then strained to yield a nutty creamy flavored milk. Hemp milk is naturally rich in protein and amino acids. In yeast-derived milk products, sugar is mixed with yeast and the resulting fermentation process creates the whey and casein proteins (which are identical to those found in milk). This is then combined with plant-based sugars, fats, and minerals to reproduce the milk, which can then be used like regular milk, including cheesemaking. Milk substitutes produced in this way do not require the use of animals and compared to regular milk production are more efficient, produce fewer greenhouse gases and utilize less land (as no animals need to be fed, medicated, impregnated, milked, and slaughtered when no longer productive). Lactose is the major sugar found in dairy milk. Lactose intolerance occurs when an individual is deficient in the enzyme lactase, which breaks down the lactose in the intestine. Bloating, cramps, constipation, or diarrhea may result when an individual who is lactose intolerant consumes a dairy product. Due to genetic differences, intolerance of lactose is more common globally than tolerance.. Rates of lactose intolerance vary globally, from less than 10% in Northern Europe to as high as 95% in parts of Asia and Africa. In a modern western context, food products which have been manufactured as dairy substitutes partly to cater for lactose intolerant individuals include milk, yogurt, whipped topping and ice cream. In Asia and Africa, where the rate of lactose intolerance is much higher than in the west and dairy production has been less predominant, many traditional analogues to dairy milk beverages exist, including amazake, douzhi, kunnu aya, kokkoh, poi and sikhye. A lactose-free food, such as non-dairy ice cream, may require a different process during manufacturing. For example, traditional dairy ice cream is made with a combination of milk products that contain lactose, but non-dairy ice cream may be synthesized using hydrogenated or partially hydrogenated vegetable oil (coconut oil, palm kernel oil and soybean oil) along with emulsifier, protein, sweetener and water. Some not yet widely prevalent synthetic ice cream products are claimed to have a similar flavour and texture to traditional dairy ice cream. However many smaller scale, organic, gourmet or slow food focused non-dairy ice cream manufacturers create all their products using traditional, natural and only slightly altered methods. The preferred base for non dairy ice creams are often coconut milk or plant cream, due to the higher fat and lower water content preventing the formation of ice crystals. Breast milk substitutes are available for infants if breast feeding is not an option. Infant formulas based on cow’s milk, soy or rice can be a supplement to breast milk or a sole source of nutrition before solid food is introduced. Infant formula is usually fortified with dietary nutrients optimised for babies and toddlers, such as iron, to ensure survival, growth and health of the baby. ^ a b c d "Documentary - Too much milk in Europe (Interview with Sprayfo)". DW Germany. 25 March 2017. ^ Lewin, Jo. "The health benefits of coconut milk". BBC Good Food. Retrieved 23 September 2017. ^ "Almond Milk vs Cow Milk vs Soy Milk vs Rice Milk". Medium. 14 June 2016. Retrieved 23 September 2017. ^ Beck, Leslie (23 June 2014). "What's a healthier choice than cow's milk: rice, soy or almond?". The Globe and Mail. Retrieved 23 September 2017. ^ Rafieian-Kopaei, M; Beigrezaei, S; Nasri, H; Kafeshani, M (2017). "Soy Protein and Chronic Kidney Disease: An Updated Review". International Journal of Preventive Medicine. 8: 105. doi:10.4103/ijpvm.IJPVM_244_17. PMC 5760843. PMID 29416834. ^ Love, Tessa (August 24, 2016). "Would you drink this milk made out of yeast? Berkeley startup bets the answer is yes". San Francisco Business Times. Retrieved August 24, 2016. ^ Simoons FJ (December 1969). "Primary adult lactose intolerance and the milking habit: a problem in biological and cultural interrelations. I. Review of the medical research". The American Journal of Digestive Diseases. 14 (12): 819–36. doi:10.1007/bf02233204. PMID 4902756. ^ Flatz G, Rotthauwe HW (1971). "Evidence against nutritional adaption of tolerance to lactose". Humangenetik. 13 (2): 118–25. doi:10.1007/bf00295793. PMID 5114667. ^ Cook GC, Kajubi SK (April 1966). "Tribal incidence of lactase deficiency in Uganda". Lancet. 1 (7440): 725–9. doi:10.1016/s0140-6736(66)90888-9. PMID 4159716. ^ Jersky J, Kinsley RH (1967). "Lactase Deficiency in the South African Bantu". South African Medical Journal. 41 (Dec): 1194–1196. ^ Bolin TD, Crane GG, Davis AE (November 1968). "Lactose intolerance in various ethnic groups in South-East Asia". Australasian Annals of Medicine. 17 (4): 300–6. PMID 5701921. ^ Flatz G, Saengudom C, Sanguanbhokhai T (February 1969). "Lactose intolerance in Thailand". Nature. 221 (5182): 758–9. doi:10.1038/221758b0. PMID 5818369. ^ Elliott RB, Maxwell GM, Vawser N (January 1967). "Lactose maldigestion in Australian Aboriginal children". The Medical Journal of Australia. 1 (2): 46–9. PMID 6016903. ^ Deng Y, Misselwitz B, Dai N, Fox M (September 2015). "Lactose Intolerance in Adults: Biological Mechanism and Dietary Management". Nutrients (Review). 7 (9): 8020–35. doi:10.3390/nu7095380. PMC 4586575. PMID 26393648. ^ Doris E. Pitz. Lactose-Free Synthetic Ice Cream. United States Patent No: 2,643,90, February 17, 1987. http://patft.uspto.gov. Retrieved November 8, 2011. ^ Feeding baby infant formula. Government of Alberta Health and Wellness. http://www.health.alberta.ca Archived 2018-01-07 at the Wayback Machine. Retrieved November 8, 2011. Adams, Ashley. "The 6 Best Dairy-Free Milk Alternatives." About.com Food. N.p., n.d. Web. 14 November 2015. Dairy Alternatives—FIW. N.p. : Dairy Alternatives—FIW, 2010. 1-8. Food Science Source. Web. 4 November 2015. Derbyshire, David. "It's Not All White: The Cocktail of up to 20 Chemicals in a Glass of Milk." Mail Online. Associated Newspapers, 7 July 2011. Web. 14 November 2015. "milk". The Free Dictionary. Retrieved 4 November 2015. "Whey Protein: Health Benefits and Side Effects". Medical News Today. Retrieved 4 November 2015. Solcan, Gheorghe, Andrei C. Grădinaru, and Şteofil Creangă. "Milk -- a Review on Its Synthesis, Composition, and Quality Assurance in Dairy Industry." Human & Veterinary Medicine 7.3 (2015): 173-77. Academic Search Complete. Web. 4 November 2015. Statista. "American Milk Consumption Has Plummeted." American Milk Consumption Has Plummeted. N.p., 24 June 2014. Web. 4 November 2015. "substitute". The Free Dictionary. Retrieved 4 November 2015. "What Is Whey?". www.nowhey.org. Retrieved 4 November 2015.